Greubel Forsey introduced its first time-only wristwatch last year, and now that’s been joined by the Balancier, which adds a power reserve indicator into the mix. Making its debut during Baselworld 2017, the Balancier shows the time – hours, minutes and seconds – as well as the mainspring’s state of wind in a fan-shaped sub-dial at one o’clock. But the highlight is the exposed balance wheel at eight o’clock that bulges from the case, a stylistic feature taken from the brand’s tourbillons. The balance wheel is a large 12.6mm in diameter, and fitted with six gold screws for regulation. It’s in place by a V-shaped steel bridge like that used on the Greubel Forsey’s tourbillons. The bridge is gorgeously finished with black polished surfaces and rounded arms. The rest of the watch is equally lavishly executed, with polished countersinks on the blued steel hands and a frosted solid gold dial. But over on the back, most of the movement is hidden behind a full bridge that covered in minute, relief text expounding on the philosophy of creation, a recurring theme in Greubel Forsey. It’s a shame not more of the movement is visible, since it will undoubtedly be finished to an exemplary degree. 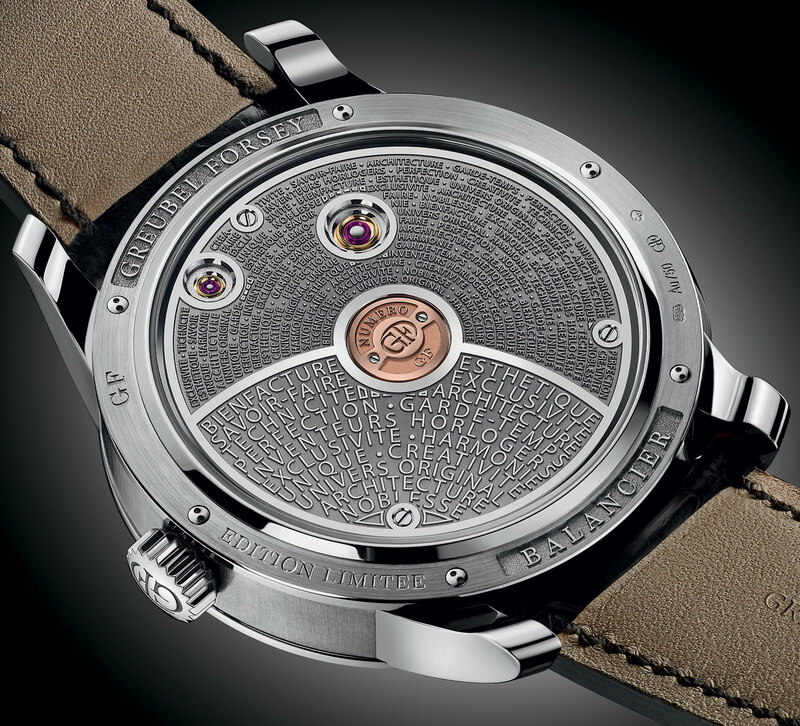 The movement is hand-wound with a 72-hour power reserve, while the case is white gold. 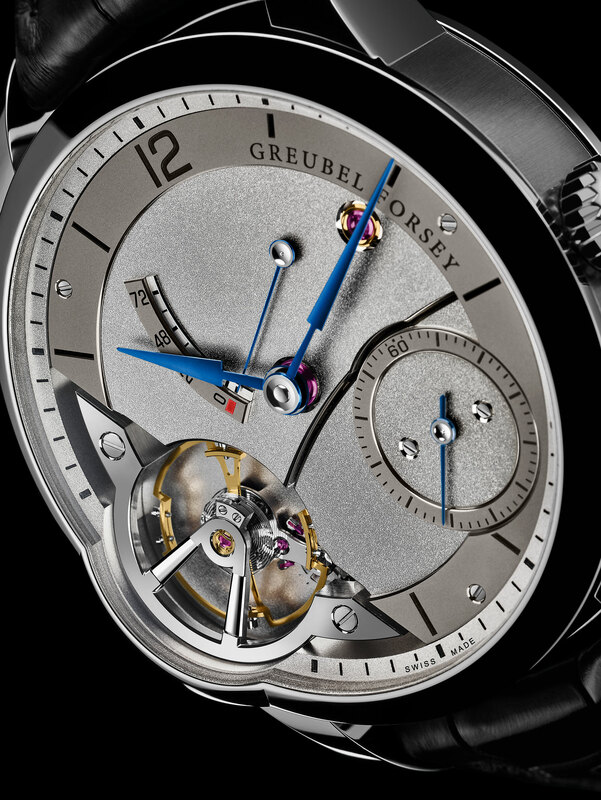 It’s largish, typical of Greubel Forsey, being 43.5mm in diameter and 13.94mm high. 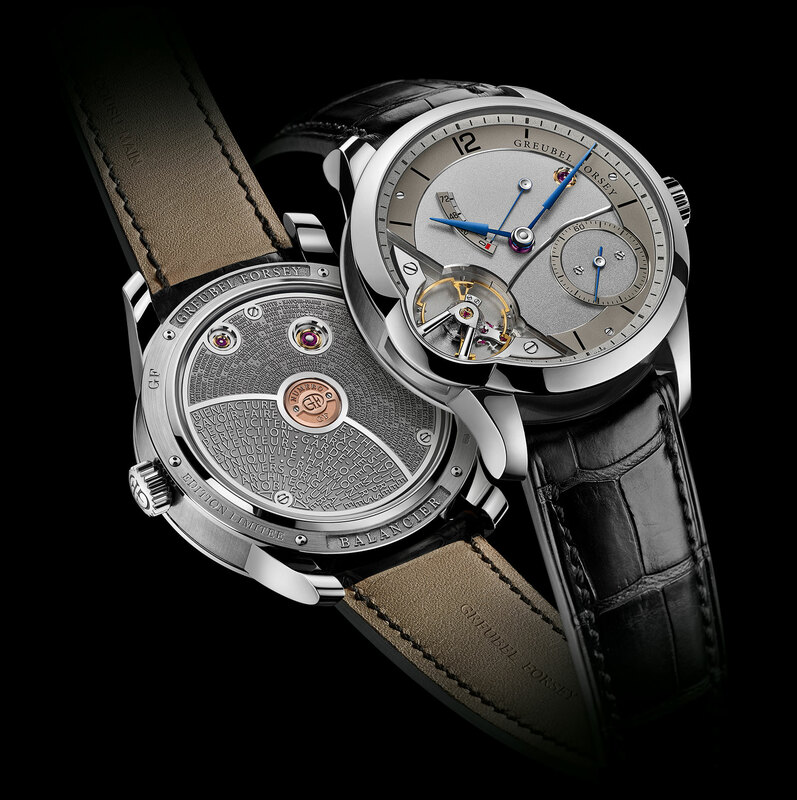 The Balancier is a limited edition of 33 pieces in white gold, priced at just over SFr200,000 (or about US$200,000). It’ll be available from Greubel Forsey retailers towards the end of 2017.